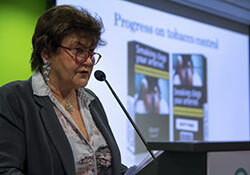 During her keynote presentation, Dr Jakab outlined that tackling noncommunicable diseases (NCDs) requires a life-course approach, supportive environments and people-centred health systems; these are also issues recognized by JA-CHRODIS. She noted several successes, including the overall fall in premature mortality from NCDs (a predicted reduction of 40% across the European Region between 2010 and 2025), and reductions related to specific risk factors (for example, alcohol consumption fell by 11% between 1990 and 2014). The Regional Director cautioned, however, that strong challenges remain, such as addressing childhood obesity. The Regional Director also shared examples of WHO’s work to support policy-makers in addressing NCDs, such as the development of the Tobacco Control Playbook, a collection of evidence-based arguments to counter the challenges that tobacco control leaders have faced in implementing various articles of the WHO Framework Convention on Tobacco Control (WHO FCTC); a recent report on tackling food marketing to children; and a policy audit tool for health-enhancing physical activity. Dr Jakab concluded by inviting Vytenis Andriukaitis, European Commissioner for Health and Food Safety, and partners to celebrate joint achievements at the European Conference on progress in the implementation of the United Nations High-Level Declaration on the Prevention and Control of NCDs, to be held on 8–9 June 2017 in Moscow, Russian Federation. JA-CHRODIS is a Joint Action funded under the third EU Health Programme 2014–2020. It brings together over 70 associated and collaborating partners from national and regional departments of health and research institutions, from 25 European countries. These partners work together to identify, validate, exchange and disseminate good practice on chronic diseases across EU Member States and to facilitate its uptake across local, regional and national borders. JA-CHRODIS’s focus is on health promotion and primary prevention, as well as the management of diabetes and multimorbid chronic conditions. It is a three-year initiative, running from 2014 to 2017.